The San Jose Blog: Three Retail Spots Being Filled at 360 Residences! Three Retail Spots Being Filled at 360 Residences! When the 360 Residences high-rise tower was completed years ago in Downtown San Jose's SoFA District, it came with over 11,000 SQFT carved out for retail across seven different units. Unfortunately, most have been sitting vacant throughout the building's history. 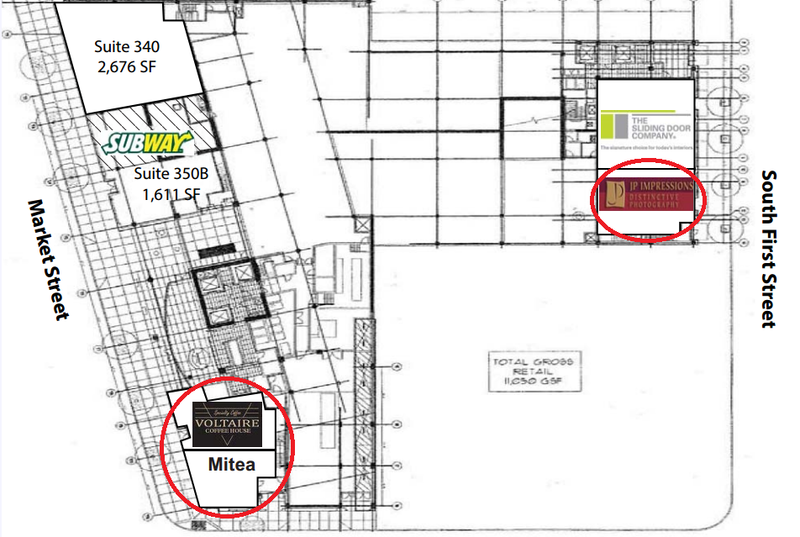 The first unit to be leased went to a Subway on Market Street (to complement the other 5 Subways Downtown I presume). The second was only leased about a year ago to The Sliding Door Company. Now it looks like 360 Residences is finally going to fill up the majority of its retail spaces. A photography studio called JP Impressions is taking a spot on South First Street next to The Sliding Door Company. I think this will be a great fit in the artsy district and hopefully they will participate in South First Fridays and other SoFA events. On the corner of Market Street we will be getting Voltaire Coffee House--which I believe is an independent store--and a place called Mitea which I think is a tea shop. After these new businesses move in, there will only be two retail units left at 360 Residences... a huge improvement over the vast empty spaces on the building's ground floor over the last 6 years. It's about time! I was hoping a Chipotle or some other eatery would lease the spot. It's in a prime location with the convention center and hotels there. Unfortunately I'll be relocating and won't be able to enjoy these new spots. But congratulations to San Jose for the impressive growth this past year and this coming year! A Chipotle? !!! Where are your priorities? Hooters would be a nice addition to DTSJ. How about H & M or Zara? I don't care if it's a chain or not a chain....as long as it's good. And Chipotle IS good! Better than another bubble milk tea in the area.And now there is going to be three coffee places underneath 360 Reaidences....SMH. Sofa Market closed down until Spring, thanks to the city screw up! Bar was not allowed to open and pave way for success for businesses there.